Australia's Red Centre, a magnificent landscape of epic proportions, packed with indigenous culture, alluring watering holes and of course, the world-famous geological marvels of Uluru and Kata Tjuta. Ingrained in the imagination of anyone who wants to explore Australia, the remoteness and vastness of this area can seem intimidating. But with frequent flights from all major cities into the region's hub, Alice Springs, as well as excellent road connections, visiting the Red Centre is both affordable and definitely doable! There are several options for exploring this stunning area of the Australian outback. Firstly, there are an abundance of tours available to suit any timescale and budget. Definitely the easiest option, pick an itinerary that takes your fancy and sit back and socialize as you are led around the most jaw-dropping sights. Alternatively, you could explore the outback yourself and road-trip around the area, sleeping at campsites and even resorts near to all the major sights. You could pick up a rental from the airport at Alice Springs or incorporate it into a much larger road trip around the rest of Australia! 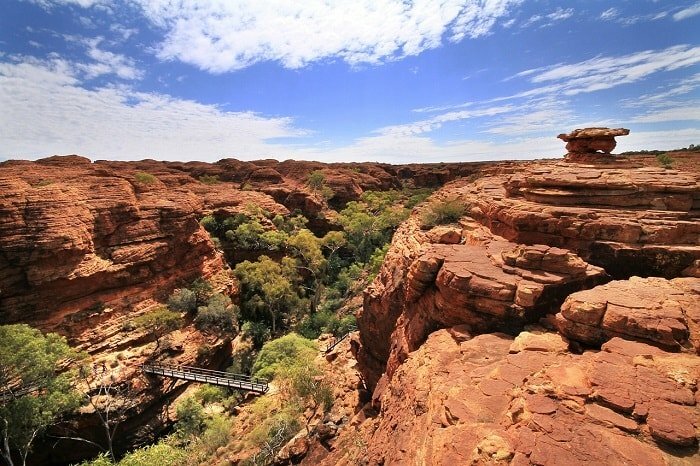 However you choose to experience the Red Centre, there are definitely cultural experiences and walks through gorges and landscapes you cannot afford to miss! Read on to make sure you hit up these essential stops and get planning your outback adventure! 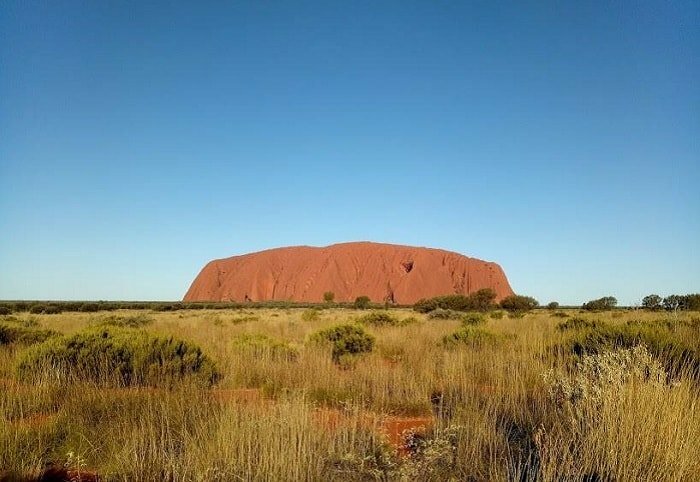 Of course no list would be complete without Uluru, famous across the globe and one of the most recognizable attractions in the world. A sacred Aboriginal site, Uluru is a giant sandstone monolith rising up from the flat Central Australian Desert to the awe of those in its shadow. It is an impressive sight around the clock, but watching as it transforms from black to fiery red amid a pastel sky backdrop at sunrise and sunset are experiences not to be missed. It also sets you up with the perfect beginning and end to a day of hiking and exploring the area. There are a multitude of walks to choose from to experience it from all angles. The Base Walk is 10.6km, takes around three to four hours and is most definitely the best way to fully appreciate Uluru. However, there are excellent shorter walks, notably the Mala walk (2km return) and Kuniya walk (1km return) which allow you to explore the base and view rock art and Aboriginal meeting places. To greater understand the significance of the area and Aboriginal culture, head to the Cultural Centre. There's a wealth of information on how people have survived for so long in such a harsh environment and you can also see traditional art in the making. 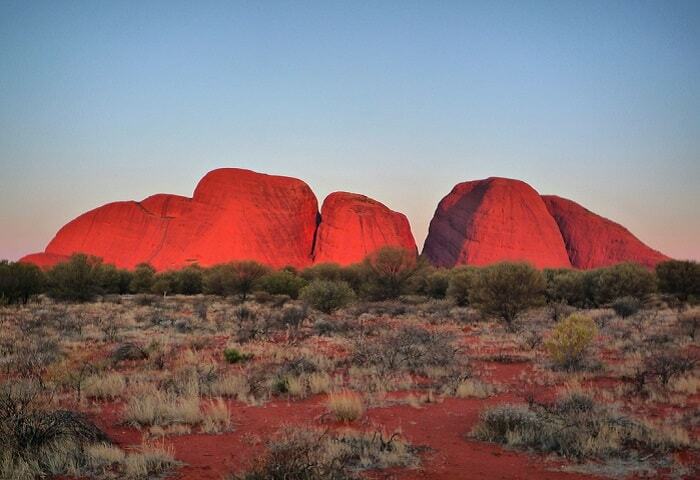 A cluster of 36 huge, domed rock formations also known as The Olgas are the next on our list of must-sees. While a second early wakeup call may be a struggle, we highly recommend setting off at sunrise for the Valley of the Winds walk. The unbelievable tranquillity and staggering size of the domes will be yours to enjoy pretty much for yourself, before the crowds arrive later on. Also, it's useful to know that during the warmer months it is common for some walks to close for safety reasons by late morning, as temperatures rise to around 40 degrees. Getting in early ensures you won't miss out! Again, there are a variety of walks available, just pop over to the Ayers Rock Resort visitor information center for maps and details. A four-hour drive from Uluru on the way back to Alice Springs is the deceptively large and impressive Kings Canyon. The the crater rim walk offers the chance to roam through the surprisingly diverse landscapes and descend into the Garden of Eden. Probably the most varied and challenging of the walks in the Red Centre, allow plenty of time for the 6.4km route and, (as always! ), get going early to beat the heat. The first section is incredibly steep, but once you've scrambled to the top you can enjoy amazing views across the whole Watarrka National Park. From here on in it is thankfully flat, as you meander past several lookouts with views across the canyon and scramble through crevices in the rocks, it really is like a wild adults’ adventure playground. The final third of the walk takes you down to the Garden of Eden, a slice of peaceful paradise. The canyon walls and rising sun reflect in the water, which is almost black from the gum tree sap. 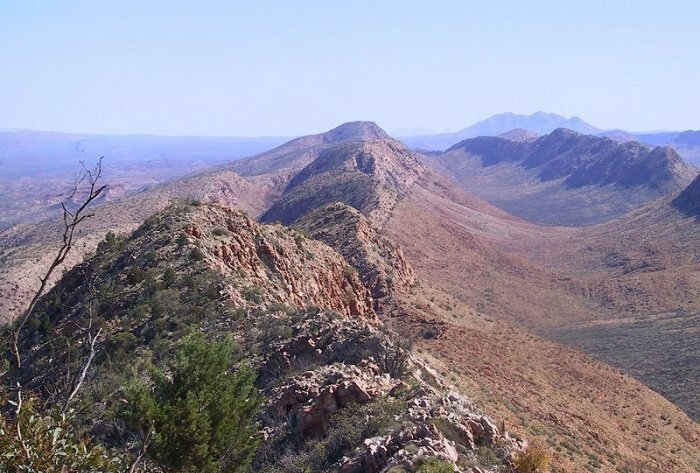 Very often overlooked, despite being the most accessible, are the East and West MacDonnell Ranges either side of Alice Springs. If the idea of exploring deep red gorges and cooling off in waterholes sounds like your kind of trip, then don't miss the MacDonnell Ranges! Trephina Gorge in the East MacDonnell's has a sandy gorge walk where you can explore the giant red rock formations and there’s a selection of basic campsites with toilets and fresh water that only costs a few dollars. The West MacDonnell's has a great circular loop that takes in the impressive mountain range, a sacred Aboriginal site called the Ochre Pits and many amazing water holes where you can cool off from the blazing sun. Keep your eyes peeled and you might just spot a wallaby chilling out in the shade!